I already commented on this release on this board but wanted to do so again, as at other times I might have put too much weight on the negative aspects. So moderators, if you think this should be in another thread, feel free to move my post. 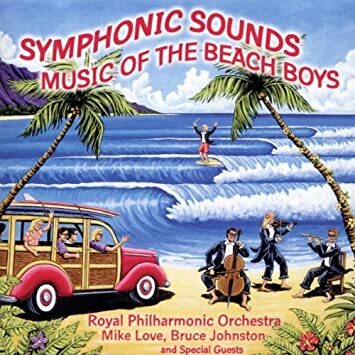 The Symphonic Sounds album features a lot of examples where the idea of playing Beach Boys songs with an orchestra shows the potential such a concept has. A lot of really well done performances. And the album is also an excellent production! The weak stuff unfortunately is so bland that it drags down the rest of the album. Namely the song selection is a big problem. And Adrian Baker. If you aren't Jan Berry, Brian Wilson or Phil Spector, than don't try to play Rock'n'Roll songs with an orchestra, especially if you don't play the backbeat. The melodies of the Rock-songs are strong enough that you can re-arrange them and make something worthwhile (Jan Berry for example re-arranged "Drag city" as a Bolero). They did a very good job on "Darlin'". But even when the backbeat is played (the Surf-medley and "Wouldn't it be nice" , the latter being more or less a cover of the original and showcasing an electric guitar playing the lead melody), it all sounds wrong and as if not a lot of thought was put into it. "Kokomo" and "Disney girls (1957)" are nice, Mike and Bruce sound very good. But the arrangements add nothing. Both songs are more or less the same as the original ones, only now the orchestra plays the parts. You can appreciate it for what it is but nothing more. I am sure Adrian Baker is a nice guy and he certainly loves to sing Beach Boys songs. I don't mean this in a disrespectful way but each single thing I have heard from Baker's music fills me with deep disgust. In fact his only contributions that I kind of like are on "Summer in paradise": the surf guitar licks on "Island fever" and the "way-in-the-background" falsetto on "Still surfin'". That's it. And his contributions on Symphonic Sounds are just as unlistenable as anything to my ears. That's a shame. Now, the medleys "Overture" and "Water Planet Suite" show a lot of great examples of the potential of such a project. The lonely violin playing "Surfer girl"'s melody, the slowed down arrangement of "Wouldn't it be nice"'s intro, the beautiful way the strings play the background vocals of "Don't worry baby", the cellos on "Sloop John B.". There are many very beautiful parts. And when the "Water Planet Suite" goes into "All summer long" you realize what is wrong when using a song like that and not re-arranging it. It sticks out like a sore thumb. Same goes for the chorus of "Good vibrations". A couple of songs get an individual treatment. "God only knows" is just beautiful. Although it sticks to Brian's original arrangement it also adds something new. Tammy Trent's vocal is really nice, although it looses power during the ending. Not enough can be said about what a great singer Matt Jardine is. And "Darlin'" showcases that. It also uses the orchestra in a very dynamic way. No drums IIRC and it works. Really a cool performance. As I already said, the production is excellent. If you own the album, listen to it again on a good hi-fi. You'll find a lot of beautiful music. The album's weak points, which I tried to point out, are: a superficial look at the catalog of Beach Boys music and the bland arrangements especially on Rock-songs. And Adrian Baker. Congratulations anyway to Bruce Johnston, Bob Alcivar and Keith Wechsler for making this album and everyone who was involved. No matter how good you think you are, don't add extra noise to songs that are already classics. They not only think they are good. They are great musicians. It's not their fault if they get told to play arrangements that we don't like. It takes nothing away from their skills. I have the Symphonic Sounds CD; enjoy it a lot. Think they did a good job with this. I really liked this one. Despite the great playing and arrangements on the original Pet Sounds recording, what we have today just sounds too mushy to my ears. Whether it's because the original master wasn't available for any of the remasters (isn't the best quality in the vaults a copy of a copy or something like that?) or because of Brian's recording technique, allowing the instruments to bleed together, I just don't get on with the lack of separation between the instruments. Hearing something close to the original arrangement, with higher fidelity - and crucially, the original vocals - is a real treat for my ears. I'd go further, and in my fantasy world, I'd like to hear all of the Pet Sounds instrumentation re-recorded, along with the original vocals. Some of these tracks clearly work better than others, but I'm always up for hearing those beautiful harmonies in another context. I would totally agree with you about the mushiness if we had access to only the mono track. But the Stereo remasters of WIBN give this song all the clarity it needs...to my ears it sounds so clear its almost like I'm in the studio while it's being recorded. I'm glad you're enjoying this track though! I think there's something for everyone on this album if people are open minded about it. Also, welcome back to posting after 12 years! Are those Bruce harmonies on Kokomo new? I'm here to talk about some interesting things on the album. Sounds like on Help Me, Rhonda they were able to pull The Guitars on the intro from the Mono Master as well as Carl's Solo. His solo sounds less echoey. I sent the MP3 file through a channel separator in Audacity.You hear the true fiddly sound that Carl was trying to play. Makes me wonder though was Help Me, Rhonda suppose to be a Country Rock song? On Heroes and Villains, it sounds like they found some of the missing 2nd verse vocals which had been missing for a while and isolated them for the mix. Brian sings a single vocal during that part, which is doubled on the Mono Mix. These vocals weren't used on the Sunshine Tommorrow Vol. 2 Vocal only Mix. On Kokomo, you can hear a buried Bruce harmony vocal double. Which is awesome! On Wouldn't It Be Nice, Mike's Solo Vocal is isolated for the bridge which is clearer than ever before. Better than the Stereo Mix. Lastly on Good Vibrations all they had to work with was the Mono Master but, with technology they were able to push elements up in the mix. Regarding "Good Vibrations", there are multi-track elements at their disposal (whether they used them or not), including most (or all) of the backing track elements, plus part of Carl's lead and some layers of backing vocals (as heard isolated in the "Love and Mercy" film and in a rough mix floating around). Also, not sure if it's been mentioned yet, but the unused acapella tag from the PS box set has been incorporated into "God Only Knows," which is a nice touch. They've been playing more tracks from the album on the SiriusXM channel today. I heard "Darlin'" and "God Only Knows", both of which sounded at least better than "Fun Fun Fun." Evidently Bruce was not consulted on the album, as he was surprised Jerry Schilling put "Disney Girls" on it. I kind of wish "Forever" had been on the album so that each band member had a lead vocal represented. All who were involved in this project should be fired. Sadly this album cements the fact The Beach Boys are has beens. Jerry Schilling being in at BRI is probably the best thing that's happened to BRI as an organization in EONS. Let them do this project and then, if all goes well, we should be seeing more substantive releases in the future. This project is fine as a shot in the arm for the "brand." I think you have missed the point. Despite all the talk of the album as ‘art’ and ‘new audiences’, it boils down to making money at the end of the day. I don’t think any legacy artist thinks any differently. it’s a quick cash grab. Scraping that barrel. No, they're there on the original mix. They're just mixed much louder in this new mix. They've mixed those Bruce bits up to just about equal volume as Mike's lead. The booklet has a quite comprehensive list of players on the original recordings, for those who like those things. At least instrument wise - vocally they just tend to stick to lead vocals, except Kokomo which just has vocals by Mike, Bruce, Carl and Al and Heroes And Villains, where they credit the backing/harmony vocals (all 6 members at the time). I still don't like Kokomo, but having the Bruce harmony louder on this version makes it a lot nicer sounding. It would be nice if they remixed it without the dated ‘80s production. It might make the song a bit more bearable. When I first heard about this project, I was sceptical to say the least. I have been pleasantly surprised by how good it sounds to my ears. I often imagine classical elements to BB songs, so I guess this record speaks to me. I am glad it is in my collection.